'Better Than Super': Russia Reacts To Trump-Putin Summit In Helsinki Some Russian commentators and politicians rejoiced after Monday's meeting between the two leaders, with one columnist even calling it "another small miracle." 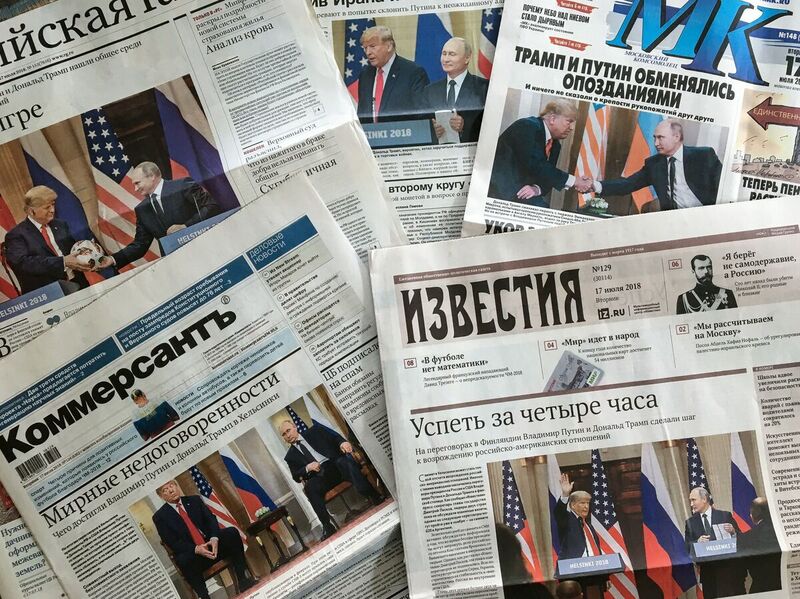 The front pages of Russia's July 17 newspapers feature pictures of the summit between President Trump and Russian President Vladimir Putin in Helsinki. When Putin militarily intervened in Ukraine in 2014, President Barack Obama called Russia a "regional power" that threatened its neighbors out of weakness, not strength. Russia's annexation of Crimea set off a precipitous decline in relations with the United States. When he took office, Trump could not reverse the trend because of accusations that Moscow interfered in the 2016 election. "The summit was yet another small miracle created by Trump," columnist Edward Lozansky wrote in the newspaper Izvestia. "As much as they tried to humiliate Trump or give him unsolicited advice, the American president disdainfully brushed aside his enemies and confidently strode to his goal." The official government paper headlined its lead story on Tuesday with the words "Ball in play" over a photograph of Putin giving a soccer ball to Trump during the post-summit news conference. State TV focused on the imagery of the two men meeting in the picturesque Finnish capital and used the words "substantive" and "productive" to describe a meeting that had produced no formal agreements — not even a final communiqué. The business daily Vedomosti was more cautious, using the headline "Dialogue without guarantees." "They're not cracking open the champagne in the Kremlin but are getting ready for long, hard work," said Tatiana Stanovaya, a Russian political analyst. "They didn't plan to close any deals or move ahead on any issues. They wanted to legitimize dialogue — to bring it back." There is relief in the Kremlin that Trump didn't do anything unpredictable, make any demands on which further cooperation would depend or just appear ambivalent, according to Stanovaya. But despite the friendly atmosphere, she said, the Kremlin is aware Trump could still end up taking them by surprise. Alexander Gabuev, a senior fellow at the Carnegie Moscow Center, says that in the short term, the Kremlin can be happy about Putin's burnished image as a statesman who holds his own with the U.S. president. "The long-term impact can still be pretty nasty, because both presidents missed the chance to move forward on really tough issues like strategic stability involving nuclear arms," said Gabuev. What's more, Trump's conciliatory, almost apologetic tone toward Putin — he blamed U.S. "foolishness and stupidity" for bad relations — may have played well on Russian television, but in the United States, it's causing outcry from Democrats and Republicans alike. "Judging by the reaction in the U.S., the whole press conference will create a stinky mess that will not easily go away," said Gabuev. Kremlin loyalists have been rushing to Trump's defense on social media. "Hysteria has begun in U.S. over Putin-Trump meeting in Helsinki," tweeted Alexey Pushkov, a Russian senator. "Mainstream media are gleefully attacking Trump. Enormous resistance to normalization of relations with Russia." "Freedom in America has clearly become the main victim of the establishment's fight against Trump the revolutionary," commentator Sergey Markov posted on Facebook. The arrest in the United States of Russian student Maria Butina shows that "millions can now be quietly arrested for their views," Markov wrote. Butina was charged with secretly working as a Russian agent just hours after the Helsinki meeting ended. "Putin will be cautious and observe what happens with the fallout from this summit," said analyst Gabuev. "If he discovers that Trump can absorb the damage, he will move very carefully toward a next meeting, but probably not in the U.S."
Putin's Washington visit may still be a ways off and depends on the political situation in the United States.